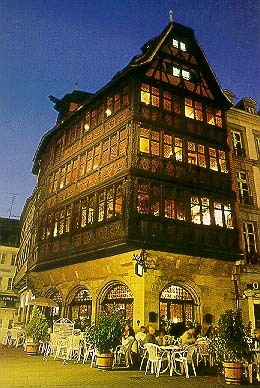 Built in 1427, this is a beautiful restaurant located in the heart of downtown Strasbourg, facing the Cathedral. La Maison Kammerzell is also a historical monument, with remarkably well preserved 15th century architecture. The local specialty is the choucroute (sauerkraut) and Maison Kammerzell prepares some of the best choucroutes we've ever tasted. Also worthy of a visit are the foie gras dishes, and the tarte flambée dessert. Tel: 03-88-32-42-14.